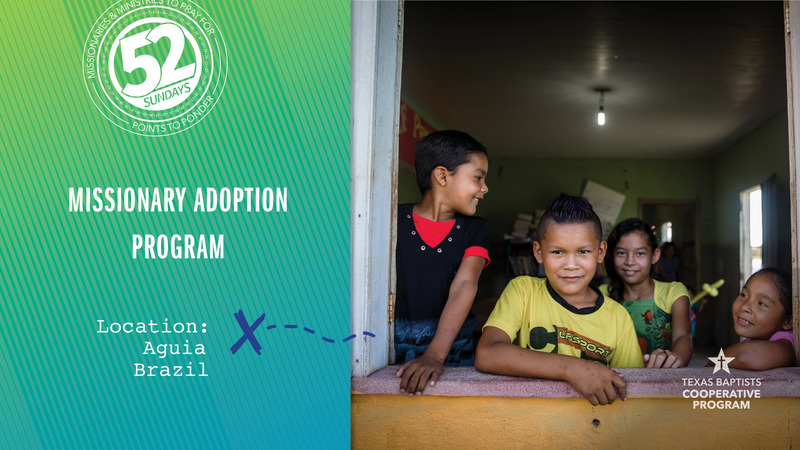 The Missionary Adoption Program (MAP) is changing lives around the world. As a ministry of Texas Baptists, this program partners Texas churches with churches in a host country to jointly sponsor an indigenous missionary. These missionaries focus on evangelism, discipleship and church planting within communities where they already know the language, understand the culture and have natural connections with the people. Texas Baptists have adopted 50 MAP missionaries serving in Brazil. Last summer, 29 Texas Baptists traveled to several communities along the Amazon River where the Brazilian missionaries engage in work with unreached people groups in impoverished areas. For four consecutive days, the team divided into groups for dental work, an eye clinic, children’s activities and evangelism. Many people came to faith in Christ and were given Portuguese Bibles, and the new believers were connected with the local missionaries for future discipleship. Pastor Terry Johnston, of First Baptist Church McGregor, was even able to meet his adopted missionary, Rhuan, for the very first time. The two men worked side-by-side for the entire week. When our church gives through the Cooperative Program, we help support the Texas Baptists Missions Team whose ministries, such as MAP, help spread the Gospel to unreached areas of the world. Join me in praying for the work of these missionaries and the Missions Team.